Buck Run Baptist Church > Buck Run Blog > Kids Ministry > We’re Hunting Easter Eggs! April 4th @ 10:00 am, Buck Run hosts our annual Easter Egg Hunt at Rehoboth. Children ages 12 and under will be hunting thousands of Easter eggs. But not if we don’t get the eggs to hide! We need your help to fill the need. 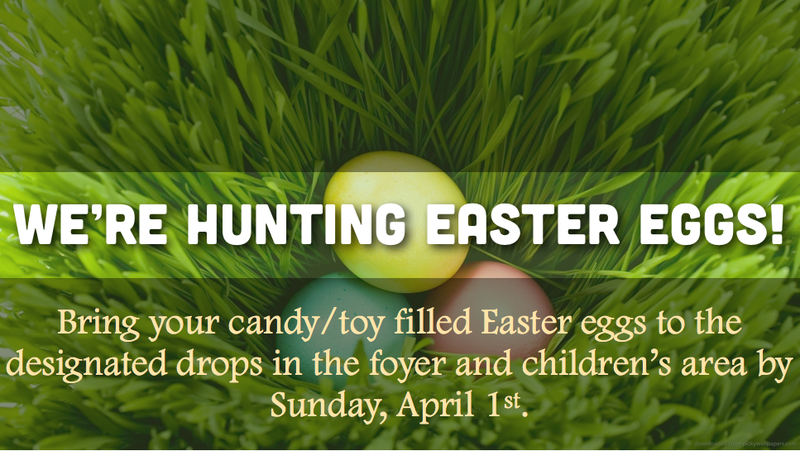 There are two drops located in the foyer and the children’s hall for you to donate eggs filled with candy or toys. Please make your donations before by April 1. Make plans now to join us for the Egg Hunt on April 4th. Invite your friends and neighbors for this great morning.